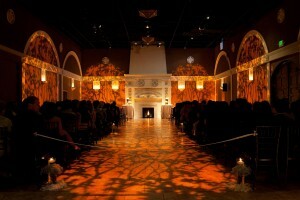 We had the privillege of working with Tashan and George for thier October 30th wedding at Casa Real n Pleasanton. Tashan was the most memorable bride for 2010. Tashan went to several different florist and we won her over with our professionalism and attention to detail. Tashan wanted everything perfect for her union with George and I can not blame her. I want t perfect for them to. The guests were greated with a floral heart in pale pink roses and burgundy cymbidium orchids. The Ceremony - was stunning! We did all white florals and Fantasy Sound came in and had warm amber leaf gobos down the aisle and walls. As you walked into the ballroom the room had 10 large arrngements of plum branches that Fantasy Sound pin spotted. The burgundy colored complimented on the stunning Divine Coffee linens from Classic Party Rentals. The room was filed with warmth with the coffee and wam burgundies that you wanted to drink in all night. Thier Photographer Julie Mikos captured the day beautifully and has graced me with some photos. Congratulations to my favorite couple of 2010. Enjoy!